Home » » Couple Arrested for Fraud. A Kandivali-based woman and her husband, posing to be Anti-Terrorism Squad (ATS) officers, have been arrested by the Satpati coastal police in Palghar for cheating ten people out of Rs 63.15 lakh in a fake job scam. 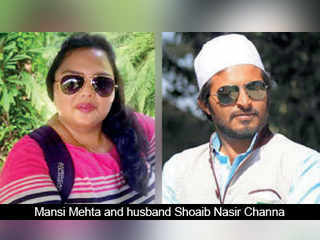 The two, Mansi Mehta and Shoaib Nasir Channa, were arrested and produced in a Palghar court yesterday. They will be remanded in police custody for four days. Two more accused, a Palghar resident and his Andheri-based accomplice, Bhavesh Mehta and Bharat Bhatia, are absconding. “The four worked in tandem, with Bhavesh and Bharat cheating people who approached them for jobs in a fake Australian resort, and then when the victims approached the police, Mansi would assure them of the recovery of their money while Shoaib would negotiate a ‘service charge’ with them,” said API Kishore Shinde of Satpati coastal police station. The job scam took place over a year-and-a-half from January 2016 till July 31, 2017 with victims losing a total of Rs 53.20 lakh to Bhavesh and Bharat and Rs 9.95 lakh to Mansi and Shoaib. “We have arrested Channa and his wife, Mansi, and are on the search for the other two accused,” said Shinde. “At the police station, Mansi Mehta was unable to provide an ID card to prove that she was an ATS officer. On further questioning, it was confirmed that Mansi was a fake officer as the ATS doesn’t have a recovery squad,” said Palghar police station inspector Kiran Kabadi. “We are investigating into whether the group has cheated any other people from the city or outside it,” the inspector added. The duo have been booked under various sections of the Indian Penal Code including 120b, 170, 420, 465, 467, 468, 471, 472 and 473 for conspiracy, impersonating a public servant, cheating and forgery.